A couple of months ago in Part 1 of this series, I announced that this racing season I would be attempting to answer some questions about training and racing with power on a mountain bike. So, how is this project coming along? Here’s my update on what using my Quarq SRAM S2275 mountain bike power meter has taught me so far this season. You don’t know what you don’t know…until you know it! I’m excited to say that I’ve had a few breakthroughs so far this season, thanks to my power meter and coach, as well as some stubborn hard work on my part! I am lucky to have such an amazing coach that can be wholly trusted to guide me towards my goals (including my “A” race of the season – the upcoming Leadville Trail 100), as well as can expertly discuss what the resulting data means. I’ve done several races already this season, many of which were repeats of last year’s first time experiences (I only started racing mountain bikes last year and this is my first season as a pro). Having experienced the courses prior allowed me to relax some, but then again that also means I knew the pain and challenge I was about to face, and was apprehensive about what it’d be like to race with pros. My natural strength stemming from my roadie days is climbing and grinding out efforts on fire roads; although my technical skills have improved over the past year, I often lose time on twisty or technical single-track and descents. I know from my training rides (especially on the road bike) that I can put out the watts from the gun, but when it comes to race day I’ve learned that I need to strategize and optimize my strengths better. This is where the power meter has become very useful. In the past, I tended to use my strengths as much possible to my advantage – for example: going all out on the first non-technical climb to put a big gap between the rest of the pack and myself. However, over-extending myself like this makes me prone to “noodle-arms” on the descent, which ends up multiplying my mistakes, thus losing me the position that I just worked so hard for. This is exactly what happened earlier this season at a race in Crested Butte, CO. I charged up to the front of the pack on a climb – passing competitors and grinding it out hard – then promptly came close to nearly riding off the trail more than once. I saw riders I’d passed just minutes ago pass me by and thought, “That could have been me.” I realized that I needed to save energy for the bike handling and management that’s so vital to successful descending. It’s scary to take risks, but I needed to try something new. 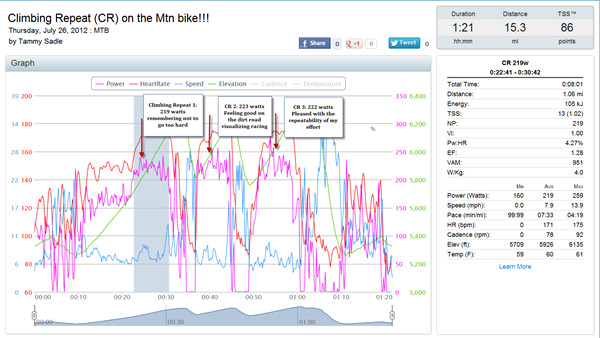 So I leaned on data from my power meter. At a recent short distance race in Winter Park, I let the leaders climb away from me as I paced myself near my threshold, but not over, so that I’d have enough composure going into the trail. It worked! I was able to catch the leader mid-way through the race, having some high-end efforts left in the tank for climbs later on. I finished a close 2nd. This was a breakthrough! See the TrainingPeaks graph below where my Quarq power meter showed that I was just over threshold for the first climb of the race, and that I was able to repeat those efforts with in +/- 5% on successive climbs without ever overtaxing myself (see the full Activity Viewer here: http://tpks.ws/dowVtfle). Now, see the graph below of the climbing repeats that my coach Daniel Matheny of Carmichael Training Systems prescribed for me pre-race to mimic the efforts I would put forth in the initial Winter Park climb. As a veteran MTB coach, Daniel is familiar with the kinds of efforts that are required in my races. He thus prescribed me above-threshold repeats that would give me the conditioning I needed to race. These short and intense power intervals were tough, but I know that I did four sets of them with limited amount of rest and survived! Knowing this kept me going during those tough climbs at the race (see the Activity Viewer of the workout here: http://tpks.ws/GemX). Knowing what efforts you can produce based on your power meter is great, but also knowing when to tap into that and when to hold back is most important for race day. I’ve found racing with the power meter most useful for monitoring myself and verifying that I’m going hard enough to stay on pace, and making sure that I don’t “zone out” during long climbs when I’m all alone. Based on data from past workouts, I am aware of what power zone I can sustain all day and what zone I can do, for say, 20 minutes. Testing my limits in training grants me this confidence in my ability during the race: when I’m in the “pain cave,” I used to worry that these sustained efforts would result in my blowing up. Now I know it’s just a grim place I’ve been before and, with a few minutes of recovery, I can actually go hard again. Knowledge is power! Or in this case, power is knowledge. If you liked this article and want to learn more about Tammy’s experiment with power on the mountain bike, read Part 1 where she poses the questions faced by mountain bikers who want to race with power.